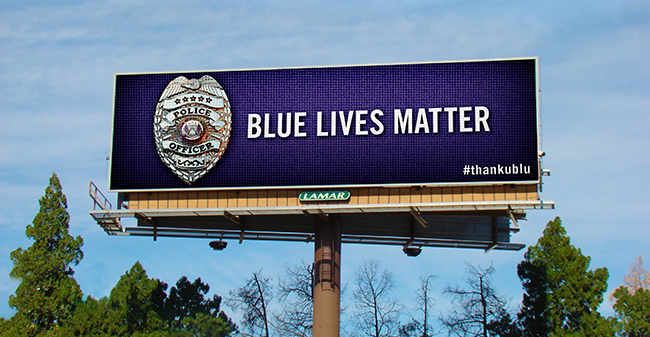 Baton Rouge, Louisiana’s Lamar Advertising Company has donated 302 digital billboards with a Blue Lives Matter graphic and #thankublu Instagram link to promote support for law enforcement. Conceived by Memphis branding agency Tactical Magic, the billboards first appeared in that city, but Lamar has expanded their exposure nationwide. Tactical Magic creative director Trace Hallowell said a citizen approached him about honoring those who serve in local law enforcement. The original Tactical Magic billboards, which went up in June showed support for the Memphis PD. As the popularity grew, Hallowell approached Lamar about a national campaign. “This time the message was simply to affirm the humanity of our men and women in uniform. No one should be a target of violence because of what they wear,’’ Hallowell said. Lamar agreed to widen their distribution on their company-owned digital billboards. The new message can be seen from Oregon to New York, and from Iowa to Texas. I, for one, appreciate the positive gesture. This entry was posted in Media, Misc., Politics. Bookmark the permalink.